You can view the eBook directly by clicking on the link above, or alt-click and select "Save link as". 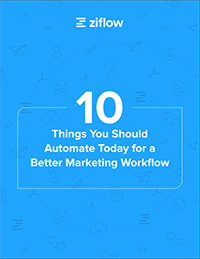 Cloud-based automation for your busy marketing team to streamline the time-consuming - but critical - tasks associated with the production of your creative assets. Ziflow does the heavy lifting, leaving you free to unleash your marketing magic. We write about marketing operations and strategy.